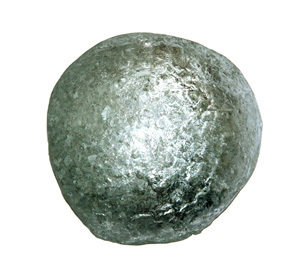 Zinc is a naturally occurring metallic element found in nearly all igneous rocks and soil. It occurs at low levels in ground water, but can be found in high concentrations in tap water due to leaching from pipes and fittings, especially in waters with low pH. It is essential to human health, but can give water an astringent taste and opalescent appearance. Zinc is an essential human nutrient (daily requirement: 15-22mg/day) and is found in many foods, especially those with high protein content. It is generally not a health concern in drinking water, but poisoning from high doses can lead to toxic effects such as vomiting, fever, nausea, stomach cramps, and diarrhea, and long-term use of zinc supplements can lead to copper deficiency or problems with the immune or digestive systems. Zinc can be treated with reverse osmosis, typically removing 98-99%.